This week, the Labour MP Ruth Smeeth gave an interview about the racist abuse and death threats she has faced from supporters of Jeremy Corbyn. The whole thing is well worth a read. It joins testimonies from many other Labour MPs, questioning Corbyn's leadership and the behaviour of his followers, some of which I list here. These MPs raise hard questions which Corbyn and his team show no signs of answering; except to dismiss the askers as crypto-Tories, or worse still, Blairites. The MPs deserve a more respectful answer than that. They have decades of service to Labour, and long and impressive records of fighting for the underprivileged. I am frankly baffled by the idea that they declared no confidence in Labour's duly elected leader, because they cannot tolerate his message of kindness and solidarity. The alternative explanation, that Corbyn is failing to meet his responsibilities but too stubborn to change, is not one the party leadership cares to contemplate. 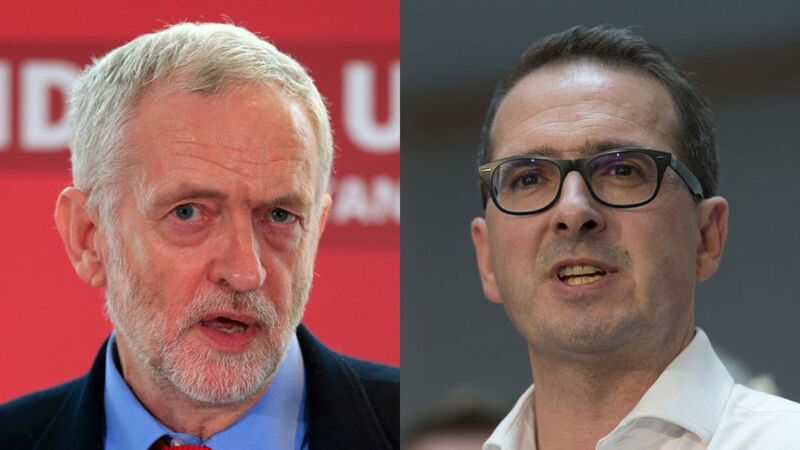 Jeremy Corbyn (left) and his leadership opponent Owen Smith (right). Be that as it may, it seems nearly certain that the result of the leadership contest tomorrow will confirm Corbyn's re-election. For better or worse, Labour is becoming an organisation in which nothing but absolute and uncritical loyalty to Corbyn's leadership will be accepted. To put it mildly, this will not appeal to the broad spectrum of voters needed to elect a Labour government. I'm not a member of the Labour party. I've never voted for it. In a Labour/Conservative marginal seat I would have, but I've never lived in one. I care about Labour to the extent that we need a progressive party of government, and Labour is the only one on offer. I would like decent public services, for myself, my family, and my neighbours; and as I've written before, I am more than willing to pay sufficient taxes to fund them. Maybe Corbyn will surprise us all and create a mighty social movement which, when the Tories, media, and opinion pollsters aren't looking, rises up and transforms the UK into a fairer and kinder society... but even as I type these words, I'm very sure it's not going to happen. It's too bad. Many decent people have devoted themselves to the dream, and voted for Jeremy Corbyn in this contest; as far as I can see, they're in for crushing disappointment. This means we can expect a long period of Conservative government. On the current trend, they will win the 2020 election easily, helped along by parliamentary boundary changes. They probably wouldn't be dislodged in 2025, maybe not even in 2030. My son was born in 2014, and it's entirely possible he will be old enough to vote before the UK has someone other than the Tories in power. I think it would be a terrible outcome. This is not just because I disagree with the Conservatives, although I do; theirs is a cruel and petty vision for the country. Without a viable opposition to bring the fear of electoral defeat, any government will become arrogant, careless and lazy. We are seeing this already, with things like Theresa May's half-baked plan for expansion of grammar schools. What will our next non-Tory government look like, a decade or two down the line? I have absolutely no idea. The British centre-left is fragmented between fratricidal Labour; Scottish and Welsh nationalists; a handful of Greens; and the stubborn, scattered remnants of the Liberal Democrats. I don't know who or what could construct a winning coalition from this motley gathering -- or the remains of it, if Scotland declares independence. I fear it will be a very long time before we get to find out.